While I am sure there are those are fascinated by what I choose to get from Netflix (you know who you are ), I actually had a point to make here. 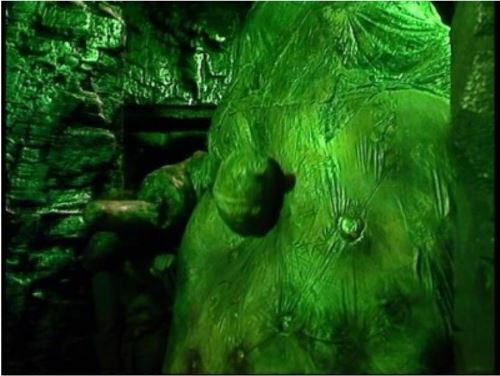 I recently watched the Tom Baker episode The Creature from the Pit, which has a decent storyline but was arguably let down by the design of the creature itself. (There are those that argue it was just a bad story to start with and those that argue that it was written as an anti-capitalist satire that the director didn’t understand.) As I watched the special feature in which Mat Irvine, the person in charge of the visual effects including the creature, and some of his crew talked about the problems involved in the serial, I realized that this was a lovely example of why we should value customer collaboration over contract negotiation. Apparently the script described the creature as “a giant, feathered (or perhaps scaled) slug of no particular shape, but of a fairly repulsive grayish-purplish colour…unimaginably huge. Anything from a quarter of a mile to a mile in length.” (Quote from here.) I suspect someone trying to realize this would have a horrible time of it even in today’s world of CGI effects, but apparently in the BBC at the time you just got your requirement and implemented it as best you could even though both the director and the designer were concerned about its feasibility and could point to a previous failure to create a massive creature in The Power of Kroll. Alas, neither the designer nor the director felt empowered enough to work with the writer or script editor (or someone, I’m unclear on who could actually authorize a change) on the practical difficulties of creating a creature with such a vague description, resulting in what we tend to have a laugh at now. I don’t know what the result would have been if there had been more collaboration in the realization of this creature, but it seems to me that the size and shape of the creature were not really essential to the story. Various characters say that it eats people, although the creature vehemently denies this, and we see some evidence that it accidentally crushes people, but neither of these ideas requires a minimum size of a quarter of a mile. It seems like the design could have gone a different way, that was easier to realize, if everyone involved had really been able to collaborate on the deliverable rather than having each group doing the best that it could in a vacuum.